At the time of the interview, Sofia Escobar was appearing as Christine Daae in the classic musical, The Phantom of The Opera, at Her Majesty’s Theatre. Born in Portugal, and having made her stage debut there, Sofia has performed and toured extensively in Portugal and Brazil. Since arriving in the UK Sofia has studied at the Guildhall School of Music and Drama, and subsequently starred as Maria in West Side Story and is now enthralling audiences at Her Majesty’s Theatre. She has also appeared on television in Portugal and is also the voice of Jasmine in the Portuguese version of Aladdin. Sofia recently took time out from her busy schedule to answer a few questions about herself and her career. I understand that when you were about 4 -5 years old you used to sit your dolls in a row and sing to them. Your love of music has continued from that time. Where do you think this passion has come from and was there anyone in particular who inspired you? I believe some things are born with us and get developed in time, I think my passion for music was born with me and I was lucky enough to grow up in an environment that allowed it to blossom. All through my life there have been many people that have inspired me and continue to do so. Teachers, friends, and amazing performers, too many to name! You were born in Portugal and trained at the Conservatorio de Musica do Porto in Oporto. What are your favourite memories from that time? I made a few of my best friends while in the Conservatorio and we all share amazing memories together from coffees by the sea to crying over exams that didn’t go so well, I had so much fun and learned so much. What was it like being the Portuguese voice for Jasmine in Disney’s Aladdin? A dream come true! I hope I get to do more for Walt Disney, it was a dream! Your first stage debut was playing “Gata” in the opera “The Zoocratas” in the Rivoli Theatre, can you describe this time? I was very young and inexperienced but loved every second despite the nerves! You performed as Hanna Gzelak in the Portuguese musical Scents of Light, can you tell me about that experience? It was my first musical and it was when I realized that I really wanted to do musical theatre, I started working really hard on my technique and being extremely disciplined from then onwards. You were a resident actress with the theatre company A Oficina, and also touring extensively in Portugal and Brazil. What was it like being on tour in the show? It was incredible, magical times where I made hardly any money at all and had an absolute blast travelling and doing what I loved. Arriving in London to study classical singing how does this compare with your studies in Portugal? It was much more demanding and at that point I had a lot to lose because I was risking a lot, had a loan to cover my expenses and my parents gave our house as a guarantee to the bank so I had a lot of sleepless nights thinking: What if I don’t make it? But I loved being a Guildhall student, I miss it! 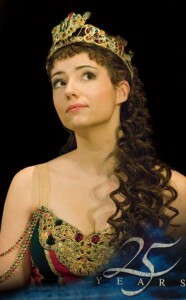 You auditioned for the role of understudy Christine Daae and are now performing as the lead role. Can you describe this ‘journey’? It was like nothing I ever imagined, I first auditioned to get the feel of how things worked, never thought I’d ever get the part, I was still in school! When I got offered understudy it was such a thrill I can’t even describe it. Performing as Maria in West Side Story, you were nominated for an Olivier Award for Best Actress in a Musical and won the Whatsonstage Theatregoers’ Choice Award in the same category. How would you describe ‘your’ Maria and what was it like being in the musical? It was yet another dream role. Maria is such an amazing part. I did my very best and even although it was hard work it brought me so much, personally and to my career! I was a much stronger and mature performer after West Side Story. Why do you think The Phantom of The Opera remains such a success, what is it that draws the audience in? It’s flawless, an incredible story with all the ingredients that we all adore, the love story, the amazing music, it’s thrilling to watch and it will remain so for many years to come. How would you describe the emotions that go with performing as Christine and how would you describe her and the emotional conflict that she has with The Phantom and Raoul? It’s an incredible love triangle and Christine goes through so much at such a young age, she’s a challenge to play. Basically she is attracted to very different things in these two men and in my opinion would always be incomplete no matter what her choice was. As well as on the stage, you have also performed on television in Portugal in the TV series “Morangos com Açúcar” as professor “Olívia Matos”. How does acting in front of a camera compare to being on stage? It’s a completely different experience and it was very interesting to get to know a bit more about the TV world, I’d love to have a chance to explore it a bit more during my career. I often read on Twitter about your warm-up music, in contrast to that of John Owen-Jones. What type of music do you like to use to warm-up with and to listen to? My warm-ups are usually a bit more classical, I do scales, several different types of vocalization to warm my voice gently and as for the music I listen to it depends on my state of mind, it can go from Muse to Mozart, I have very eclectic taste. What would be a typical ‘show’ day for you? I’m usually at the theatre around 6pm for an evening show so during the day I tend to meet up with friends, go to the gym and occasionally have singing and acting lessons. Katie Hall is the Alternate Christine Daae, what is it like sharing a dressing room with her and do you spend much time together? We hardly see each other because she’s there on my free days and vice-versa so we only see each other during rehearsals or occasional coffees! Which is your favourite dress to wear (and in which scene) in The Phantom of The Opera? I love the blue manager’s dress and cloak, it’s gorgeous. Wishing is also my favourite scene and song to sing. When you are off-stage what do you like to sing (in the car, the shower etc)? Disney! And an awful lot of musical theatre songs! Is there anyone in particular that you would love to sing on stage with? I wanted to sing with John-Owen Jones and now I have that pleasure 6 shows a week! Many others but way too many to name! Christine is a fabulous role to play but do you have ambitions to play in any other musicals? Yes, no doubt, I’d love to be Fantine, Mary Poppins, Maria (sound of music), Cosette, Norma Desmond, Eliza Doolittle and many others! How do you feel when your family are in the audience watching you perform? Nervous, very nervous, I love having them there but it’s nerve-racking! Spend time with my boyfriend and with my friends, go to the theatre, movies, have nice meals and long walks in London! What would you say to any young actress that is thinking of a career on the stage? Training is the most important thing, never give up and follow your dreams! What message would you like to say to your fans? A big thank you with all my heart for all the love and support through the years. I can’t put into words how much it means to me and how much your support lifts me in the harder days! Lots of love to all!